Our third meetup was a fermentation party. We are still getting to know each other, but we went to work as if we had been doing this for years. We all rolled up our sleeves, put on our aprons, and began chopping like there was no tomorrow. As this meetup has been since the beginning, things just flowed naturally without anyone taking charge. I measured 1 lb of Kraut with 2 level teaspoons of sea salt and when it was pulp ([mashed] by the count of 150) I filled it in a quart mason jar up to the rim. There was juice ontop (not an inch but enough to cover the load) and then I screwed the lid tight, put it in a vessel to catch the possible overflow and left it in a warm place, not too far from the wood stove. It should be bubbly in a couple of days and ready for sampling…. This was eye-opening for me, because I thought all lacto-ferments had to be exposed to air (the vegetables must be submerged in liquid with weight, but then the jar or crock is covered with towel). It just goes to show there are so many ways to work with microbes. For variation, this is the method I use, similar to the one described in Sanodr Katz’s Wild Fermentation. Chop cabbage. Sprinkle with salt. The more salt, the longer the kraut is preserved and more sour it can become. You can make kraut with less or no salt (see below for gundruk). Mix thoroughly, and pack a crock or jar tightly, tamping down often. Place a plate or wooden lid that fits just inside the crock on top of the cabbage. Weigh it down with a jar filled with water, cleaned and boiled rock, etc. Water from cabbage should rise above the plate by next day. If not, add some salt water. Keep it covered with a kitchen towel and let it ferment at room temperature. You can start eating it in two days, but let it keep fermenting. It’ll change the flavor everyday. Once it reaches the flavor you like, you can transfer it to a jar with a tight lid, and keep it in the fridge. You can use any vegetables, but cabbage and radish families work especially well. Toko, my mother, brought Hakusai-zuke, a Japanese version of sauerkraut, using Nappa cabbage instead of regular cabbage. It is milder and sweeter in taste, with added umami from Kombu (kelp seaweed, not to be confused with kombucha). Choose a dense, firm head of nappa (hakusai) cabbage. Make a cross cut at the stem end and tear into quarters with hands. Wash, and leave them in the sun for half a day to dry out a bit. Sprinkle salt between the leaves, especially at the thick ends. Arrange the quarters in a crock, forming a circle. Place dried chili pepper pods and kelp cut into slivers between the cabbage layers. Place a plate that fits inside the crock. Weigh with a stone, water-filled jar, etc. Cover with kitchen towel and leave in a warm place. Make sure that the vegetable is covered in brine within several hours. If not, add some salt water. It’s ready to eat in 2 to 3 days. It’s easy to make a rye sour – mix equal amounts of rye flour and water in a container that holds about double the volume. I use Hodgson’s Mills rye flour myself. Leave uncovered in a warm place. It will start frothing in a couple of days. Give it a few more days, then refrigerate. Once it’s well started, you can feed rye or wheat. If you want it thicker, use more flour. I add regular yeast to raise my bread, but the sour really adds flavor. Use the sour when it has been working for awhile, and feed it up after using it. It keeps a long time, even without regular feeding, if your refrigerator is good and cold. I brought ginger bug for making ginger beer. I’m sorry to say that the batch of ginger beer was not ready for this gathering. But now the bottles are getting full with carbonation, so I’ll have a supply of ginger beer from now on. I’ll bring a few bottles to our next meetup. Here is the recipe for ginger beer as described in Wild Fermentation. Start the “ginger bug”: Add 2 teaspoons grated ginger and 2 teaspoons sugar to 1 cup of water. Stir well and leave in a warm spot, covered with cheesecloth to allow free circulation of air. Add this amount of ginger and sugar every day or two and stir, until the bug starts bubbling, in a few days. Make the beer any time after the bug becomes active. (If you wait more than a couple of days, keep feeding the bug fresh ginger and sugar every 2 days, and stir.) Boil 2 quarts of water. Add 2 to 6 inches of ginger, chopped or grated, and 1-1/2 cups of sugar. Boil for 15 minutes. Cool. Strain, and add 1 quart cold water, juice of 2 lemons and strained ginger bug. Bottle in plastic seltzer bottles or sealable glass bottles. 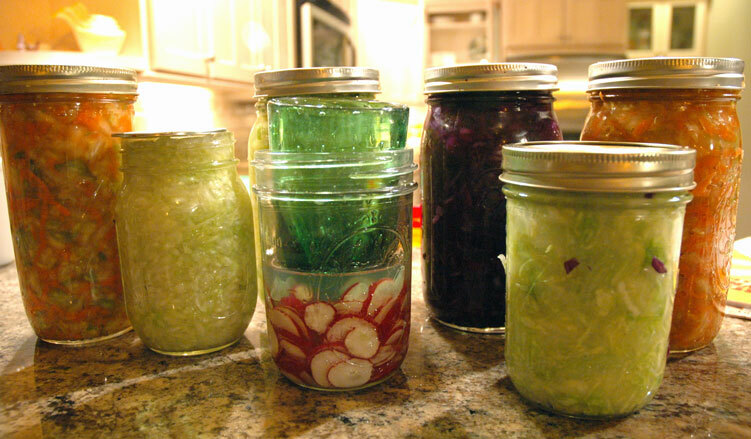 Leave in warm place to ferment, from 5 days to 2 weeks. When the plastic bottle feels inflated, move to the fridge. Make sure it is cold when you open it, and catch any overflow in a bowl. process: pick leaves, wilt about half a day, strip out any though bits, roughly chop, crush in a heavy mortar, ram tightly into jars (you want exuded juice to cover the packed leaves), age on a sunny rooftop a few weeks. Depending on the original moisture content of the leaves and the degree of wilting, it may be difficult to have enough juice to cover. Wikipedia recommends topping up with water; I never have, but I did lose a jar that was dryish to mold. I’ve never done the traditional last step of the process–sun & air drying the fermented leaves. The climate here does not seem amenable. Soak the chilis in the water 5 minutes, then blenderise with the other ingredients. Age two months on a dark warm shelf. The jar for fermenting needs to be oversize to allow for bubbling during the ferment. More oil (say, another 1 1/2 cups) will be needed over the course of the ferment to keep the chili submerged, the amount depending on the texture of the chili. Skim off any mold. CO2 gas cover helps suppress mold growth. The finale to the party was provided by Ivy Vine Players, a.k.a. Grian MacGregor, the one-person puppeteer extraordinaire. She performed a traditional English? garden song, and everyone’s favorite, Home-grown Tomatoes. It was a perfect way to end the night. The smells, the smiles; live culture night had a magical feel. Everyone was radiant. I felt like I’d been air-lifted into another century. My sauerkraut came out wonderful – a nice balance of sour and sweet, a nice fresh cabbbagy smell. Thanks, Ina!